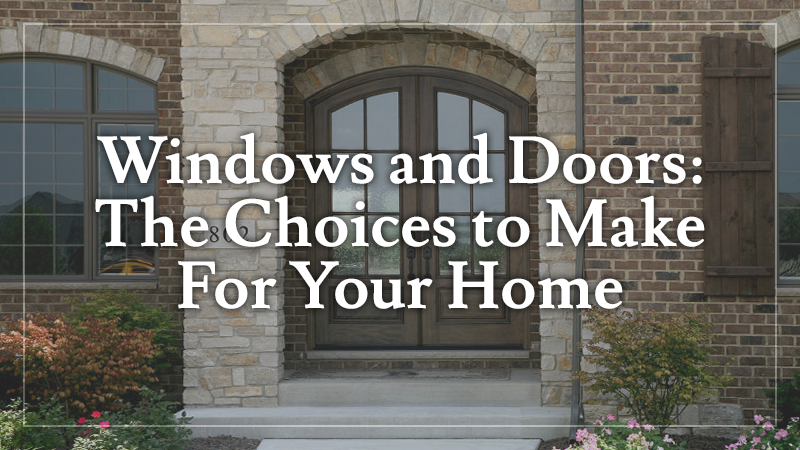 There are many choices when it comes to choosing windows and doors with more colors and options added all the time. In the past, everyone went with white, colonial style windows with six panes across the top and bottom. Now, windows come in beige, clay, bronze and many other colors. Choosing a type of window really comes down to a matter of preference, however there are a few tips that can help you decide. How is That Color Made? If you are leaning towards a vinyl window color other than white, you should ask the supplier how the color is made. One way, and in my opinion, is the color is part of the extrusion process. This means the entire vinyl window is that color. Another method window manufacturers employ is to laminate the color on top of the vinyl; MI Windows has a laminated bronze window that looks great and is high quality. The last option is the color is painted on top of the vinyl. I always do a scratch test with my finger or keys to see how easily the paint comes off, and let me tell you, I’ve tested many brands of painted on vinyl windows, and I still haven’t found one that the paint doesn’t come right off. Regarding window style, the trend is to have fewer grilles (or bars), which gives an unbroken view as you look out. One popular option is called four over four. This means there are four grids on top and four on the bottom. The other popular grid option is called Prairie style. In this style, there are two vertical bars and one horizontal bar in each sash (the part of the window that raises up and down and holds the glass). If you have an older home with wood windows that are starting to rot and plan on replacing all the windows, there are two options. One possibility is to go back with a wood or wood composite window and remove the entire window. The other option is to replace the sashes with a vinyl replacement and wrap the exterior wood with aluminum, which is a very popular choice. If you only have a few wood windows that need replaced, and you don’t want some of your windows to be vinyl and some wood, you have some choices. First, you could remove the entire frame and go back with a wood or wood composite. Another option is to get a sash pack, which can be wood or composite, and just replace the sashes. You can paint the sashes to match the color of your current woods windows. For energy efficiency, it’s always good to choose the Low – E option. This is simply a coating on top of the glass that reflects heat; during summer, it keeps your house cooler by keeping heat out but letting light in. In the winter, it keeps the heat inside. Argon is also an option to add some energy efficiency to your windows. To compare the energy efficiency of glass between windows, look at the U-factor, which is typically on the label of the window. It’s usually .32 or higher; the lower the number, the more energy efficient the window is. Let’s transition from windows to doors. Textured fiberglass and wood doors, such as mahogany and fir, are popular choices right now in new construction and remodeling. Textured fiberglass doors offer the look of a wood grain without the maintenance requirements of wood. They also don’t dent or rust like steel doors. 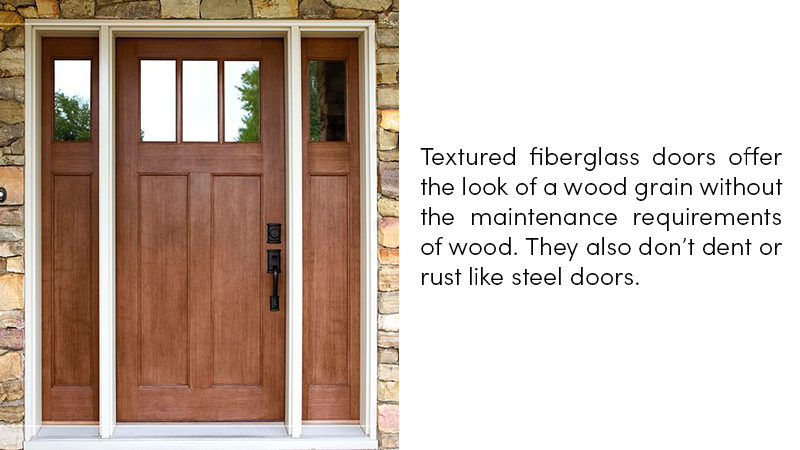 Many painters also use a gel stain on textured fiberglass doors so it looks like wood. Many people are surprised when they learn that a stained textured fiberglass door is in fact not wood. If you want a wooden door, fir offers a great price, but doesn’t have the same grain detail as mahogany, which can be twice as much as fir. Most people are going more traditional when it comes to the glass in a door, and the most repeated word I hear at building material suppliers is “Craftsman.” Homeowners are getting away from the fancy, ornate doors with lots of design in the glass and going for a simpler look with clear glass. This is a great look, but keep in mind that clear glass doesn’t provide any privacy. Luckily, there are aftermarket films you can put on the glass so people driving by can’t easily see in the house. One more important tip, if you decide to go with a wood door, is to be sure to get it painted or stained within a few days of delivery or the warranty will be voided. All six sides of the doors must be stained. Even though the top and bottom of the door are never seen, moisture can get in and warp the door. Because wood doors come with the weather stripping already attached, your painter will need to remove the stripping to paint or stain the door appropriately. There’s much more information you can learn about doors and windows. If you have more questions, give L&L Contractors a call and we’ll be glad to help.